The World Baseball Classic Qualifiers get under way on Wednesday in Jupiter, Florida and on Thursday in Regensburg, Germany. Eight teams will battle for two spots in the main event in March 2013. At Roger Dean Stadium in Jupiter Israel and South Africa are opening the event at 7pm ET on Wednesday evening. Spain and France follow on Thursday. At the Armin-Wolf-Arena in Regensburg Canada and Great Britain are kicking off the tournament at 7pm CET on Thursday with Germany and the Czech Republic facing each other on Friday at the same time. Favorites in Florida are probably Israel and Spain, while Canada and Germany are considered to be the front runners in Germany. However bronze medalist and Pan Am winner Canada is by far the best team in all qualifiers. At least on paper. Some of the biggest names in Jupiter are Shawn Green, Brad Ausmus, Gabe Kapler and feel-good story Adam Greenberg on Israel’s roster. 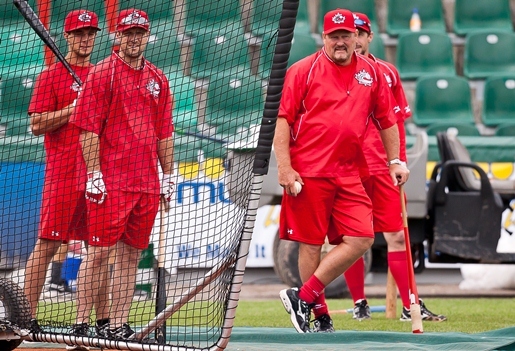 Larry Walker, Donald Lutz, Max Kepler, Toby Gardenhire, Andrew Albers and Adam Loewen are supposed to highlight the Qualifier in Regensburg. But as everywhere in Baseball, the games still will be decided on the field. Rosters have been finalized and are published. All games will be streamed live in MLB quality at www.worldbaseballclassic.com, the finals will be live at MLB Network and ESPN America is supposed to show broadcasts on a tape delay.